Happy Monday! I hope you guys had a great weekend! Our weekend was pretty low key which was really nice considering we’ve been super busy lately. On Friday we had drinks with friends outdoors which is always ideal since the weather has been so great. Saturday was mellow AND I got my mall trip in! I was so tempted to pull the trigger on lots of Fall merchandise but instead kept my composure stable and my wallet closed. One of my goals for my 101 in 1001 list is to stick to our budget for 6 months…let’s just say I have yet to check that one off the list and when your profession is in fashion, 6 months is a very. long. time, my friend. However, the Holidays are coming up (cue the emoji with the flying dollar) and I’ve got my eye on a few investment pieces…one of which is called the blogger bag (#icanteven) that will require a lot of saving. On the topic of saving, I was reading this amazing book recently which introduced me to the hilarious blog, Our Freaking Budget. Seriously if you want to get inspired to save, this family will do it and crack you up in the process. I’m sure it seems a little ridiculous to talk savings while you’re reading a fashion blog, no? Being conscious of our budget is a part of my daily routine because as much as I get major wardrobe envy scrolling through my Instagram feed, I’m pretty careful about what I buy. Hence my constant mash up of high and low end attire. 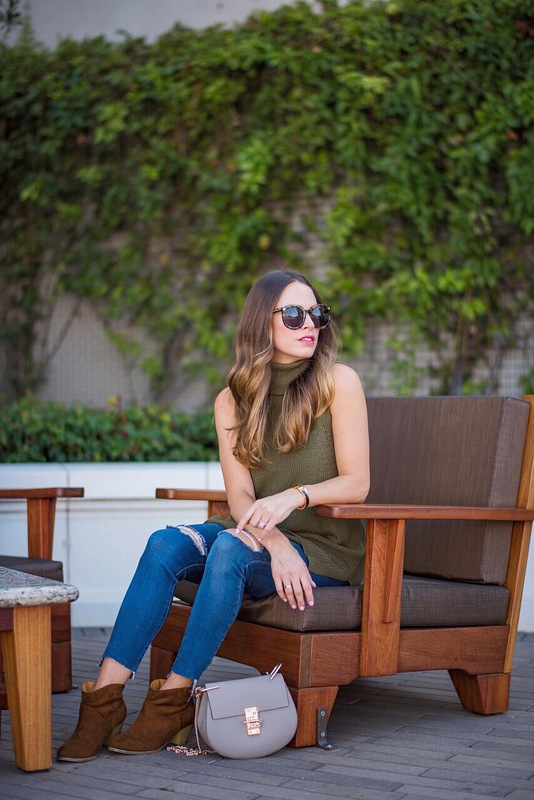 For example, this sleeveless turtleneck was a total steal on the #nsale. Unfortunately, it’s sold out but there are a handful of similar ones that I linked for you guys. A sleeveless turtleneck is ideal for those weird weather days that start off warm but end chilly…and you can always throw on a moto jacket like this one to layer with! Even though there are no sleeves, the texture of the sweater combined with the turtleneck totally say, bring on the pumpkin spice everything! Happy shopping and as always, thank you so much for following along!